A Ho Chi Minh City-based company is being denounced as a scam that has swindled a hefty sum out of a purported 32,000 victims by duping them into investing in virtual currencies to earn easy, ‘real’ money. Modern Tech, headquartered at an office building on Nguyen Hue Pedestrian Street in District 1, claims to be the authorized representative to launch ICO (Initial Coin Offering) for two cryptocurrencies, Ifan and Pincoin, in Vietnam. Crytocurrency is a digital currency in which encryption techniques are used to regulate the generation of units of currency and verify the transfer of funds, operating independently of a central bank. ICO is an unregulated means by which funds are raised for a new cryptocurrency venture. Like an IPO (Initial Public Offering), companies can launch an ICO to crowd-fund capital for a new project, aimed at creating new digital currency like the well-known Bitcoin. During the offering, a quantity of the crowd-funded cryptocurrencies is sold to investors in the form of “tokens,” just as shares are sold during the IPO, which supposedly become functional units of currency once the ICO funding goal is met. In its respective ICOs in Vietnam, Modern Tech has encouraged people to invest in two new cryptocurrencies, Ifan and Pincoin. Investors were told that the tokens they received would have their value skyrocket once they officially became crytocurrencies when the two projects were realized. Ifan is introduced as a means of payment between celebrities and their fans. The value of the cryptocurrency is said to rise “on a daily basis” as the company invites more Vietnamese singers to join the network. Modern Tech has claimed that Ifan is created as per Singaporean laws, and Pincoin is a project initiated by people from Dubai. It has been alleged that some 32,000 people had been duped into pouring money into the Ifan and Pincoin projects, which are in fact a multilevel marketing scheme, where older investors are paid with revenue generated by new investors. Ifan and Pincoin investors only began to sense that they were falling victim to a scam when the company stopped paying commissions in real money, but in “tokens.” Investors could see the value of their investment rise on a daily basis in the system, but would never be able to withdraw them in cash. Victims of the scam have lamented on social media and forums that they had lost a fortune investing in the scheme. Others were collecting signatures of victims to file an official complaint to ask for their money back. A group of victims flocked to the Modern Tech headquarters on Sunday, carrying signs denouncing its fraudulent activities, and asked to be refunded. 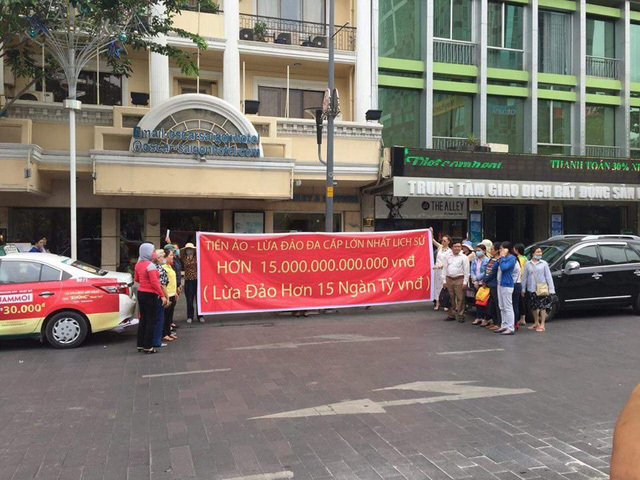 The victims said the company had conned them out of VND15 trillion (US$660.79 million).